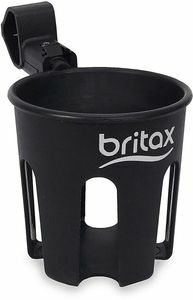 I recently purchased the Britax B-Lively and am so happy with my purchase. Albee Baby provided a great product at a great price and the product arrived quickly and in perfect condition. Thank you! I love this set. 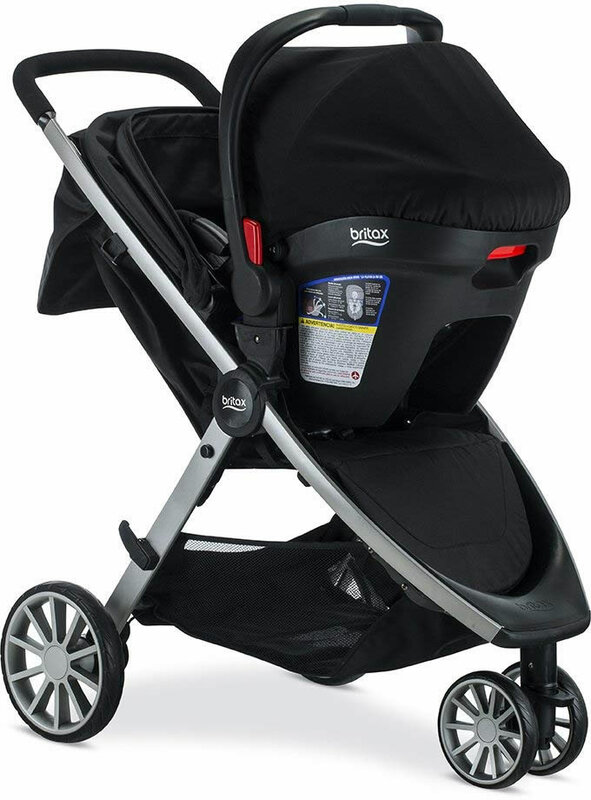 Britax is known for their safety, so you can feel good about using this for your new little one. The seat was super easy to install into your car. I love that the stroller comes with it, so you don't have to mess with any other adapters. You can easily transition your baby from the car seat to the stroller without waking them up! I love the one hand fold. I have a 2 year old and a newborn, so it is so necessary. I received this from weeSpring Parent Panel, but would definitely recommend it. I LOVE the one hand fold!! The travel system also includes the car seat and base. The base is easy to install. The car seat is nice but weighs 10 pounds which is a little heavier than our previous one. The straps can be adjusted many ways to suit your growing baby and it has the standard 5 point harness that nearly all car seats have these days. The car seat also has its own canopy that adjusts by pushing in or pulling out. 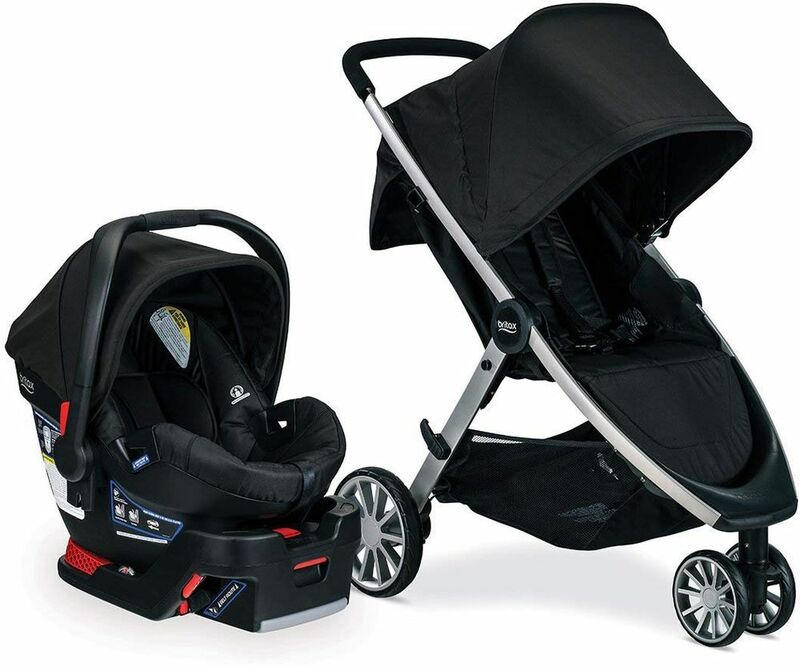 When attached to the stroller you can completely cover your baby by extending both the car seat and stroller canopies. The cargo basket is large and you can access from the back OR the foot rest area lifts up for front access. The stroller is lightweight and ideal for travel or taking in and out of your car. The brake: you put on the brake by pressing with your foot and to release you have to use your toe to flip it back up from below. I little tricky if you are wearing sandals. A second push to release would be more ideal. Wow this travel system is excellent !! The combo was really easy and took me no time at all to put together. 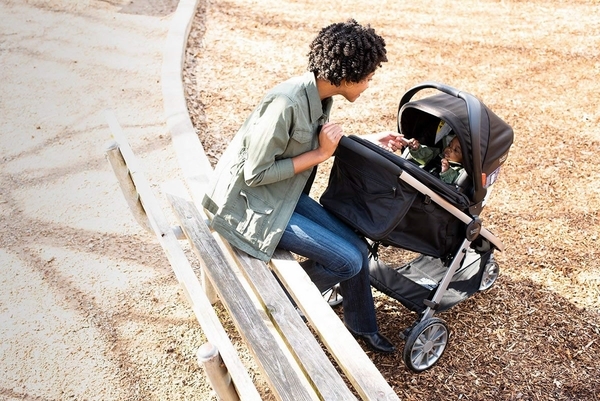 I took my newborn for a stroll down the park and was just so impressed with how easy the stroller was to maneuver. I am 5'2 and loved that the stroller was not to high or bulky for me, unlike previous travel systems tried. I really could fold and put the stroller in my trunk with just one hand. The storage space is also a really great feature. The overall design is awesome from the sleek look to the easy installation and many pockets included! The only reason I am rating this a 4 is because it lacks a cup holder, and that is huge for me and my coffee placement! But I still really love this travel system overall !! Thanks to the weeSpring Parent Panel for providing me with this Stroller & Car Seat. I received this stroller and car seat travel system as part of the WeeSpring Parent Panel. There were some really great features of both the stroller and the car seat that I really liked, and some that I didn't. The pros: It's a smaller, more lightweight compact travel system. Compared to other car seats/stroller combos, I really appreciated how easy and lightweight this system was. It was great for easy handling when pulling the stroller out of the car and unfolding it, and then folding it back up while holding a squirming infant! It was easy to attach the car seat onto the adapters and click it into the stroller for the times I wanted to leave my baby in her car seat. We took the whole travel system to Disneyland with us and I appreciated the compactness of the stroller, the easy maneuvering of the stroller through the airport and the crowds at Disney! My baby is tall and narrow, and I liked that the infant car seat was pretty spacious allowing for plenty of headroom for her to continue growing, but the channel for her body to fit into, was a bit more narrow, and therefore, more secure. She's a bit too big for the infant insert at this point but still tends to roll around in the seat without it. I liked how the B-Lively fit her really well and provided that extra secure padding around her body. We kept her in the car seat all through the airport, shuttle rides, and taxi's, and she stayed comfortable and content. The cons: The car seat is hard to re-thread. I had to adjust the straps and pull them through the back of the car seat and the padded fabric of the seat, and it ended up being very difficult to do on my own. I had to enlist my husband to help to get the shoulder straps to the proper height. The stroller basket is always my big thing- because I pack the house when going out! The stroller basket is very small. I could not fit our backpack style diaper bag into it, without cramming it in, and then there was no room for anything else. The one thing I did love was that the front footbed of the stroller pops open for easy front access to the basket. I appreciated that a lot! I think this is a great stroller for quick errands around town, but not for all day events where the baby is going to be in it for a long amount of time. I didn't feel that the seat was overly comfortable or padded, and I had a really hard time lowering the seat back once she got sleepy. Again I had to get my husband to help! With the smaller size, I did love the maneuverability of the stroller, and especially in crowded areas! It also has a larger canopy, so when it got to peak sunny time, I liked that it was great to pull down over her and covered her pretty well. Many thanks to the weeSpring Parent Panel for letting us try this system! I am on baby number 2 and have found that it is imperative to have a stroller that takes an infant carseat. It makes it so easy to move a sleeping baby from stroller to car and vice versa. With this travel system, it is easy to attach the infant seat to the stroller. Taking the infant seat off required a little bit of wiggling but that might get better over time. I found this travel system to be well made, well designed and comparable to other travel systems on the market. It was easy to install the carseat, although the carseat base is very heavy, which I found odd. But it doesn't really affect the use as you just install it once and then leave it in the car. The one handed fold is awesome! Really easy to fold, and it stands on its own after being folded. I also like that the storage basket is accessible from the front and back. I also really like the design of the system. I think the all black with red features is really attractive - more so than other designs on the market. My favorite feature is probably the parent caddy on the stroller! So many convenient places to hold water bottle, cell phone, wallet etc. So nice to have it all within reach. My son is 6 months old & an easily transferrable travel system is so handy. It's one of those things I'm not sure you fully appreciate unless you don't have one because once you do, you'll never go back. The Britax B-Lively & B-Safe Stroller & Car Seat Travel System given to us as part of the WeeSpring parent panel in exchange for this review & was everything I hoped for in a travel system. It was convenient to detach from one & transfer to the other & back again. It was also chic & not at all bulky or overly heavy. I also really appreciated the single hand breakdown feature as I have a toddler who makes anything happening in the loading/unloading process a little laborious so this being simple was exactly what I needed! I found the carseat & base to be secure, although I know some found the space for rocking unsettling, for me it wasn't surprising & knowing that it was equally safe without the base (which is mostly for convenience) set my mind at ease. It also fit well in our station wagon, having a small footprint that made sitting beside it in the back easy. My absolute favorite feature was the pockets in the attachment. It took this stroller to the next level for me as most others I've seen or used involve ordering a special accessory to provide storage for anything other than your babe & maybe a diaper bag. The design clearly showed that it had moms like me in mind. I loved the look of the stroller as well. It almost had a modern European feel that is attractive & simple with clean lines & basic color schemes. Overall, it's a great product I would highly recommend to first time parents! I received this travel system complimentary of the weeSpring Parent Panel. Setup of the product is simple compared to other strollers we have assembled. The stroller rides really well outside of some wheel sticking while turning. We took it shopping the other day and the size is perfect for tight squeezes between racks. We also had to make a run for it in the rain. This trip we had my 2yo riding in it and she remained dry because the cover extends so far out. This feature is perfect for sunny days. When using the travel system together, the cover overlaps so there's never any concern for baby being exposed to the elements. The car seat also seems much more comfortable and secure than seats we've used in the past. It is a little more difficult to release from the base in the car and the attachment on the stroller than other seats. The stroller boasts of one hand closing but you technically need two because you have to push a button before pulling the handle. The storage under the stroller is decent but doesn't hold much. You can access storage from the front if the seat is positioned to lay flat to not disturb the child, which is a nice touch. While the travel system is great on its own, one could assume the price point would include cup holders or a tray for the parent/child or both. These have to be purchased separately. As a parent of 3, I don't want to add more steps in the purchase process (I need simple and streamlined) and would prefer these accessories be included. I would recommend this product for someone who has a larger budget for a travel system and would recommend the car seat to anyone. Great car seat, great stroller - great together! I'm a second-time mom. The first time around, we used a car seat (similar to the B-Safe) with a dedicated frame stroller, and eventually transitioned to a city-friendly stroller with a similar design to the B-Lively. What was I thinking? I could have had just one stroller all along? The Britax travel system is easy to use, looks nice, and presents a much smoother stroller ride from birth than any frame stroller can. And bonus -- it takes up less space in your trunk. 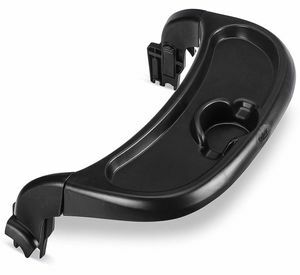 The carseat base was very easy to install and feels very sturdy. The car seat itself is nice and narrow and my newborn feels very snug and well-protected in it. 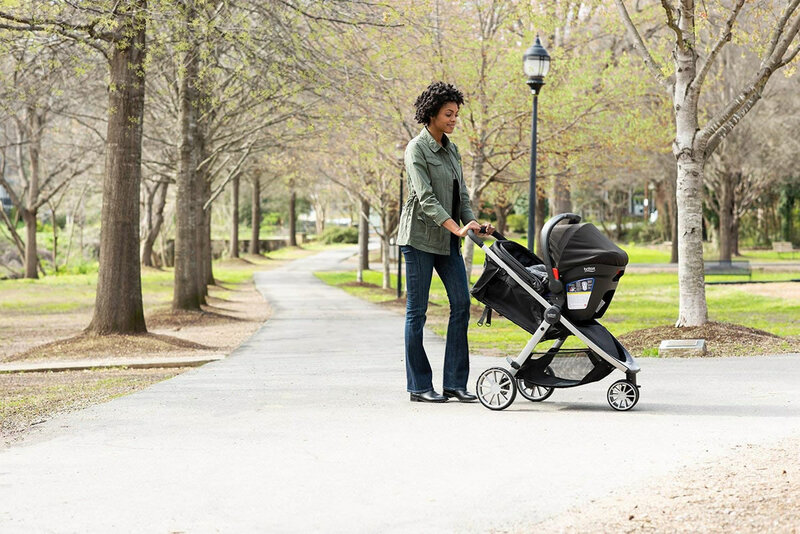 The stroller opens and closes like a breeze. It is a very smooth ride, and has a large and sturdy canopy to protect from the sun. I love that you can reach items in the basket underneath from the front or back -- this was my big gripe with my first stroller. With the B-Lively, everything is easily accessible even when the baby is in the seat. There are only two things I'd change about this travel system: the seat is a little difficult to get in and out of both the car base and the stroller - you have to lift at just the right angle. It's just taken a few days to get used to it. And I wish the system came in more fun colors, though black goes with everything! I received this stroller system to review as a part of the weeSpring Parent Panel. This is my honest assessment. This travel system has everything you need as a first time parent. It is a comprehensive system that grows with your child from infancy to well into preschool years. I am in love with this system! The infant car seat has adapters that snaps right into the stroller and you're ready to roll with your kid without ever having to wake them up. The click n go feature is safe and sturdy with a loud click sound to let you know your child is safely in place. As a first time mom, this was a good thing for me as I find myself frequently double checking to make sure my infant is going nowhere! The large canopy on the car seat is a great feature to protect little one's developing eyes. I love the privacy that is affords when taking my baby out in public. The car seat carrier is not the lightest one on the market, but it is doable for me. I can definitely tell that as my baby gets heavier it will be more difficult to take the carrier by itself. That's why the click n go feature of the stroller is so helpful! The stroller...I love the different ways that it can grow with your infant to toddler and I feel like we'll get good mileage out of this system. I appreciate the front panel storage access which means that I don't have to reach behind or leave my little one unattended by themselves as I struggle to reach for objects in the storage basket. I don't have much use for it just yet, as our diaper bag as sufficient for our current newborn needs, but I definitely find it useful for going shopping and having easy access to the large roomy storage basket. The 1 handed fold for the stroller makes it super easy and makes me feel like super mommy who has it all together when I can lift by myself into our mid-size SUV. It does not take up much room. I also appreciate the place where I can store my keys, phone, small wallet so that everything I need can be right in front of me. I can see this being useful for the future when we go to more public places like an amusement park or museum where strollers would be allowed. Overall, I highly recommend this travel system to any new parent, or experienced parent who is looking for a great system that is easy on the go and grows with your child's needs. Thank you to weeSpring Parent Panel and Britax for this travel system and the opportunity to review this product. Thanks to the WeeSpring Parent Panel for providing me with this stroller and car seat to try. Overall this is a great car seat and stroller and there were only minor things that I didn't end up liking. The latch on the back of the car seat to release it from the base and stroller was very touchy and I would spend 30 seconds trying to get it exactly right to unlock it every time. The other thing that I did not like was that the handle of the car seat stopped every 6 inches and locked unless you kept the levers pushed in on both sides. With my Chico, I would push the levers once and the handle would go all the back as far as I wanted. That was very frustrating but I'm sure over time I would get used to keeping them pushed in. The pros far outweighed the cons overall though. The base was extremely easy to install, the car seat was a tad less wide than my current one so it fit nicer everywhere, and the black color hides way more spills and stains and looks sleeker. The stroller was great too. It has an easy one handed folding mechanism, a roomy storage compartment below, and my favorite part was the opportunity for it to transition from an infant car seat carrier to a toddler front facing stroller when baby is ready. Best Travel System I've ever used! I was lucky enough to be chosen by the weeSpring Parent Panel to receive the Britax B-Lively & B-Safe Stroller & Car Seat Travel System for free to review, and I am so incredibly thankful thankful I was! This is hands down, the best stroller and car seat travel system I have ever used in the almost 10 years that I've been a parent. One of the biggest things I love about this travel system is home incredibly easy it is to push and how smooth of a ride it is, even with a bigger child or with the car seat in it. I love that I can easily steer it with one hand if needed, since I usually have a 4 and 9 year old who go on walks with me and need to hold hands. I also really like the front access for the basket. It comes in super handy when I am grocery shopping with my kiddos because they can easily put the bags of groceries in the basket for me. There are so many wonderful things I could go on and on about with this travel system. The only thing I wish was different about this stroller, is that it was a double because this stroller is love here! I highly recommend this travel system! I live in a busy city and walk almost everywhere with my little one during the week but travel frequently in the car with him on the weekends, so an easy to use stroller and car seat travel system is incredibly important to me. My husband and I did extensive research on car seat/stroller travel systems while I was pregnant so I feel like I have a good sense of what is out there and the pros/cons of a lot of the different options. 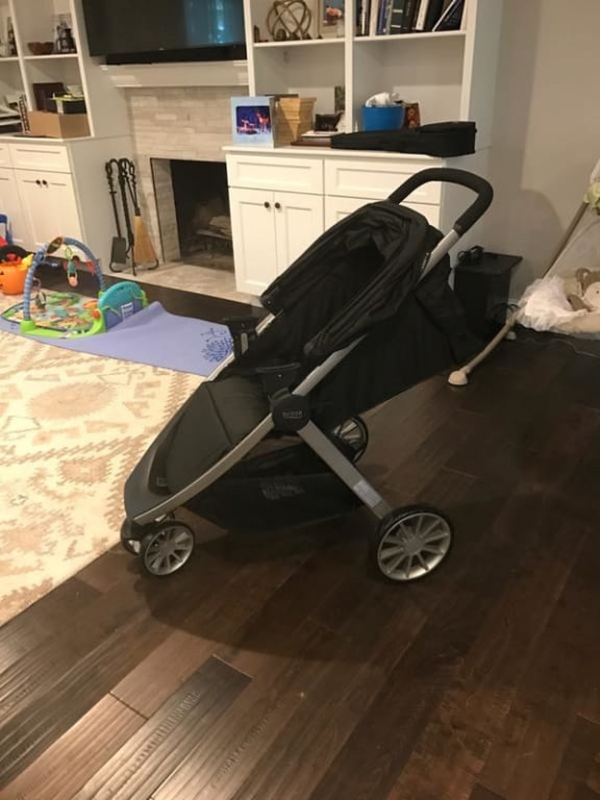 I received the Britax B-lively and B-safe Stroller & Car Sear Travel System for free through weeSpring Parent Panel and can say that it checks almost all of the boxes when it comes to ease of use, safety, and convenience. I initially thought I wouldn't like a stroller car seat travel system where the infant car seat attached directly to the toddler seat but that has actually been one of my favorite features of this stroller system so far. It allows me to have an extra large canopy or even a full canopy over my son when it rains, is really sunny or very cold and windy. It is very easy to detach the car seat from the stroller attachments and move it into my car. I also really like that the way in which the car seat detaches from the stroller is the same way it detaches from the car seat base in the car so there is no confusion about which button to press or where to pull from. The car seat base was relatively easy to install (both with latch model and lap belt) and I really like the peace of mind in seeing the indicators on the base that let you know the base is secure. I will say that the base is pretty heavy, so if you are trying to move it from one vehicle to another, that can be challenging. My little one also doesn't seem to mind getting strapped into the car seat and seems happy once there (which is not the case for other car seats he has used). The stroller itself is also really easy to use and is pretty compact. The one hand fold is truly a one hand fold and it stores nicely once folded. I love that it comes with a large pocket underneath the handle for cell phone, keys, etc. The basket under the stroller could be larger however it will fit a diaper bag (just not all my groceries, too!). The shocks on the stroller are great! We live in an area with a lot of cobblestone streets and I never get worried about my son moving around too much even when we hit large bumps. The only thing that I found frustrating with the stroller was the steering. I think because the stroller is more compact and it only has one front wheel, it's not that easy to maneuver around tight corners or one-handed. Overall, I highly recommend this travel system for its ease of use with the one hand fold and car seat installation, the smooth ride of the stroller and how comfortable my little one is while riding in it. Thanks weeSpring Parent Panel! I received the the Britax B-Lively and B-Safe stroller and Car seat travel system from weeSpring Parent Panel and it is AMAZINGGGGG. I have two other strollers (one is a travel system and one is a jogger) and the B-Lively travel system basically makes them obsolete. It was super easy to install the carseat in the car and transfer it from the car to the stroller, but by far the best thing about this stroller is how light it is!! It is by far the lightest stroller I have come across when compared to other strollers/systems with similar features and safety ratings. It has a decent size basket and the velcro shade makes it easy to check on baby when he is sleeping without fully opening it and exposing him to the sunlight. I ABSOLUTELY would recommend this stroller/travel system to all of my pregnant/parent friends that are looking for a safe, high functioning and AFFORDABLE travel system for their baby. This stroller operates similarly to other strollers that are double the price! All in all I have zero complaints about the travel system - it's a winner! This travel system is so easy to use and is loaded with great features. The stroller is incredibly quick to put together and the car seat base is just as easy to install. 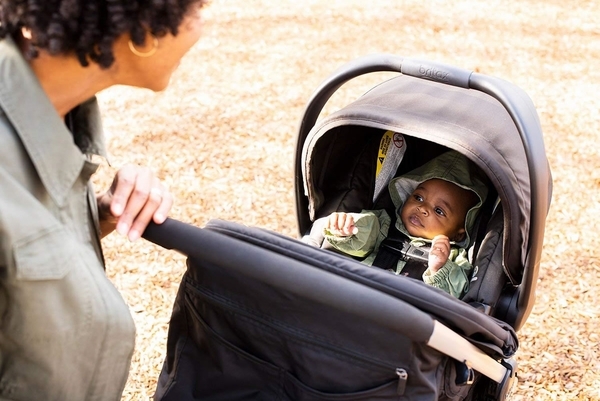 You get the piece of mind safety from the Britax brand combined with some great features like the one hand fold of the stroller and "click" noise so you know when you have everything secured. The canopy is a nice size for the seat but I do wish they had a zip or magnet enclosure for the basket on the stroller. Overall it's a great travel system and I feel really safe using it. I received this as part of the WeeSpring Parent Panel. Everything you'd need in a travel system! I'm on my 3rd kiddo and this has been the easiest stroller/carseat combo yet! The car seat installed quickly (and was very intuitive), lightweight and baby seems to like it. The stroller is so easy to use, has great maneuverability and a huge storage basket (which every parent needs!). The one-hand fold is something every stroller should have. Grab, pull, collapse and it's gone. Not tricky buttons or knobs to deal with. The car seat clicks in and out without much effort. I like that the canopy on the carseat and stroller canopy are large to protect against the sun and rain. Often, the covers don't come down far enough and your kiddo is blinded by the sun. My favorite feature is the ease-of-use of this specific travel system. Being a parent is hard enough, the gear you use should improve your life not complicate it. Thanks to the weeSpring Parent Panel for providing me with this Stroller & Car Seat. It will go to great use for the next few years. This is a very nice stroller and car seat system. The car seat is easy to install in the car and on the stroller. Feels nice and secure for baby. It is also very light compared to some other carseats. The stroller is very light and super easy to open and close where the one hand fold is very useful when holding a baby in your arms. The bottom storage compartment is not as big as I would have preferred but still can fit quite a bit. I like the feature where you can open the front at the footrest of the stroller to reach the back of the storage basket compartment. The stroller is easy and light to maneuver as well. I also like the large canopy of the stroller. I was given this Stroller & Car Seat to try as part of the weeSpring Parent Panel. I received this from the weeSpring Parent Panel and couldn't be more impressed. The carseat installed easily and didn't budge an inch when secured. We have used other, more expensive systems for our first child that didn't feel nearly as safe and secure. The stroller is exceptionally maneuverable and can be used when walking space is at a premium, like a crowded market or even a restaurant. Perhaps most importantly, the releases for the stroller and car base make sense and are intuitive. I hope other parents can sympathize with trying to get a kid out of a seat or stroller and resorting to looking up the instructions on your phone while the baby is crying - should not be a problem with this system. 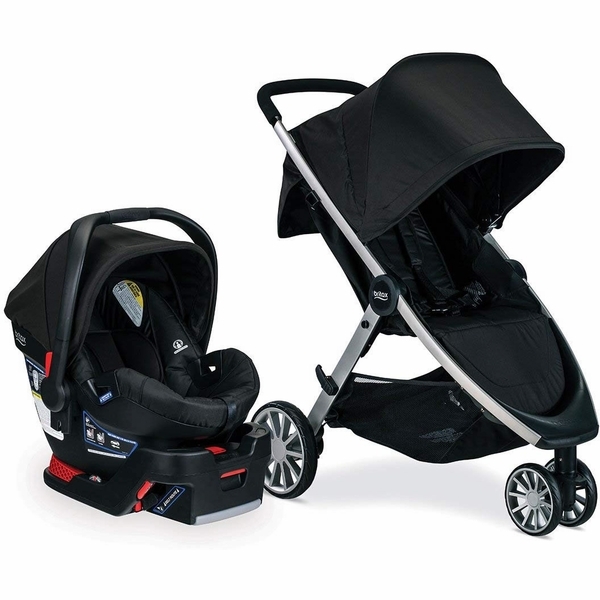 Overall, this car seat and stroller are very nice products and were very user friendly. The car seat installation was SUPER easy with the latch system in our car. The base has a good weight to it, which makes it feel very sturdy. I appreciate the "levels" on the base which let you know if it is installed correctly. We are often moving bases between cars when visiting family, so it gives you ease of mind (versus having a professional check the installation). My baby fits nicely in the car seat and the harness system feels secure. The stroller was extremely easy to assemble, including the car seat adapters. What I especially like about the stroller is how easily it folds up, as well as how compact it folds up. The compact design and light weight make it easy to put into the car and use for doctor appointments, quick grocery trips, etc. The basket at the bottom is easily accessible and a good size. The stroller is very easy to maneuver and is a smooth ride on flat surfaces. I did not give the full 5-stars for a couple of reasons. First, both my husband and I had difficulty taking the car seat out of the stroller. While it is easy to "click" in, I felt like I was about to tip the stroller over while trying to take the car seat out. I did not have this problem as much in the car, since the base is heavier and also latched into the seat. The second reason is that while the stroller was great on smooth surfaces, it was a bit of a bumpy ride on the sidewalks around my house (which in all fairness are not completely level). Other than that, I think this is a great system, especially when baby is little and it's really about getting them door to door. Thank you weeSpring Parent Panel for providing me with this car seat and stroller! I love this stroller system. I keep the stroller in the trunk of my car and simply click in the car seat as soon as we get to our destination. It's super convenient and easy to use as a travel system. Once I'm done using the stroller, the one-hand fold lets me collapse it and store it in the trunk again. My husband helped getting the car seat base into the car to make sure it's safe and secure. My favorite feature of this stroller is it's convenience! I have received this product from the weeSpring Parent Panel. I've acquired somewhat of a reputation as a stroller hoarder among friends and family... but that may be because I never found the right one. I received this stroller and car seat from the weeSpring Parent Panel about three days before my second child was born -- perfect timing. Even at nine months pregnant, I was able to easily install the car seat and assemble the stroller. I pulled out the assembly instructions, expecting to need to refer to them, but it was really intuitive to put the stroller together. I was immediately impressed by the ease of maneuvering (my top criterion in a stroller) and the attention paid to all sorts of details that take a stroller from merely good to actually great. I particularly appreciate the big canopy, easy-to-use buckle, and ability to lift the front footrest to reach into the basket. When I was discharged from the hospital about a week later with my newborn daughter, I found that inserting the car seat into the stroller was fast and easy. I never had a travel system with my son (now 19 months old) and now wonder why I didn't: it's incredibly handy to transition so quickly in and out of the car. This car seat is a little heavier than the infant seat I used with my son, but it's deep and seems like it cradles the baby cosily. On my daughter's first walk in the car seat and stroller, I was first impressed by how the wheels handled the bumpy sidewalks and then by how well the stroller repelled some unexpected rain! I've had issues with mildew on other strollers, but this fabric didn't soak in the water and dried quickly. I haven't yet had an opportunity to take my toddler son out for a walk, but I'm also excited about the fact that the stroller reclines nearly flat for a newborn, but will also meet a toddler's needs. It may be that my search for the "perfect" stroller ends with this travel system. First of all, I wanted to thank weeSpring Parent Panel for the opportunity to review this travel system. The car seat is easy to install. I thought that it was very secure. It is a little bit on the heavy side but not a deal breaker since you have the stroller. It is easy to attach the car seat to the stroller. The sun shade needs improvement. The material is a little flimsy and does not provide much coverage. It would be nice if it is UPF fabric. Another thing is the handle. You need both hands and press the button to make the handle go down or up. It is a minor thing but it makes such a big difference. The stroller is longer and narrower than what I am used to but it is stable and does not tilt to the side. What I love about this stroller is the generous canopy. 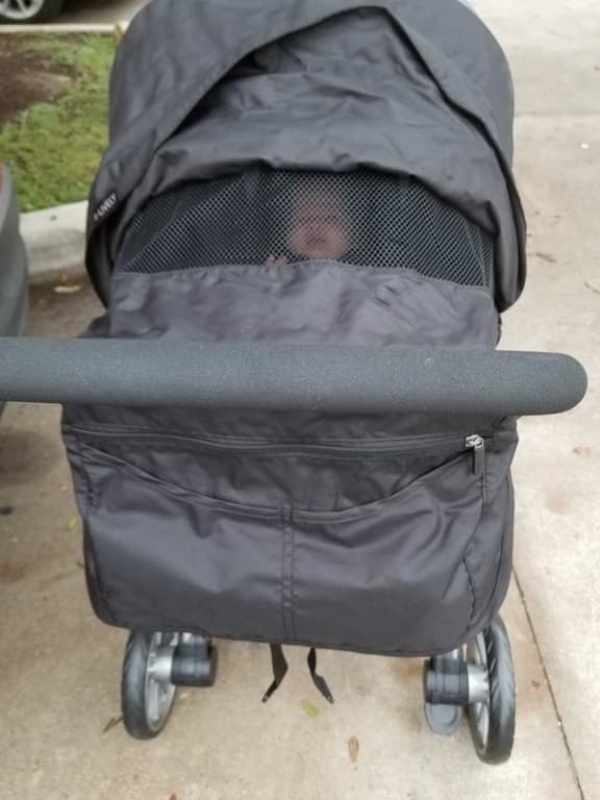 I also love the "peekaboo" feature of the stroller where you can see your child. It is wide enough to see your child and does not have velcro or magnet to keep it open/closed which can be annoying. The basket is big and you are able to access it from all sides which is great! The stroller is light, easy to fold/unfold although I am not a fan of the button you have to press in order to fold the stroller. The wheels are big enough to use on grass and uneven surface. In terms of improvement: the mechanism that adjust the back rest of the stroller is not the best. The stroller has this strap system that you have to pull at the same time or it becomes uneven and you have to use 2 hands to do this. In addition, I wish there is an option where you can take out the seat in the stroller and use it as a car seat carrier. This reduces the weight especially if your child is too small to use the seat in the stroller. You also can't adjust the handle bar. I'm 5'2 and I wish that I can adjust it so I can be more comfortable. Overall, great stroller but it still has room for improvements. Having a travel system is great because it just simplifies everything. Thanks to the weeSpring Parent Panel for providing me with thisÃ‚Â Stroller & Car Seat, it has positively changed our routine when we have to use the car. My 4 month old is a light napper, so each time I tried to transfer her from her convertible car seat to the stroller or even a baby carrier, half the time she would wake up and not want to go back to sleep. Now with the Britax travel system, she does not notice the transition into or out of the car. The stroller is light and small enough that it fights into the trunk, leaving space for other things. The car seat feels secure to the base, although it takes me a few tries to click on correctly, I am happy to have the reassuring clip that tells me I'm good to go. The seat itself seems comfortable, my baby easily falls asleep in it while in the car. The straps are easy to adjust and clip on, even with a wiggly baby. Again, being able to transfer the car seat to the stroller has been a revelation. The stroller opens easily and quickly (one push of a button then one quick pull and ta da! ), the only thing is that you have to pay close attention when snapping the seat onto the stroller or it will not clip on correctly. The first few times I had to take the car seat off the stroller, it seem hard to unlatch, but it seems to be getting easier with time and use. 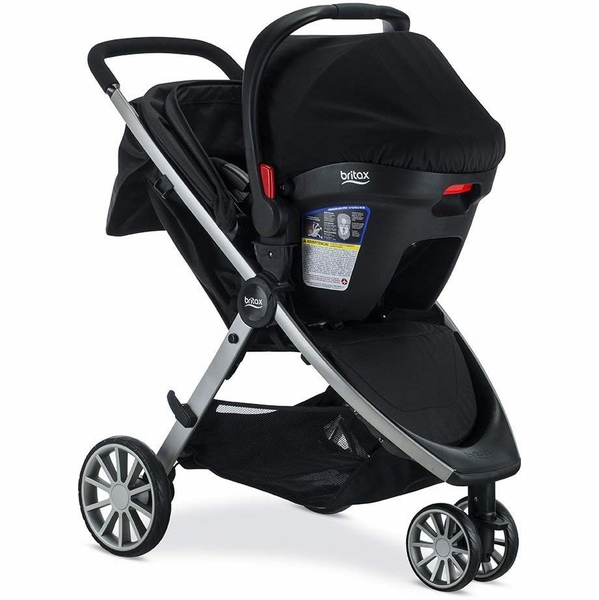 Overall, I have enjoyed using this travel system, it is great for city life with a car. The sun shade is sturdy and covers baby well, even from the wind and cold we experienced recently. The stroller is sturdy yet light, and handles well even when I have only one hand to push it. And most importantly for me, the one handed fold is a true one handed fold, unlike many other strollers I have tried before. I really love this travel system in general. The car seat seems very sturdy and secure but not too heavy. It's very easy to snap into the stroller and to snap it out as well to transfer into the car. I love the strollers maneuverability with one hand and it has so many features (recline, storage, nice sun shade etc). I think my favorite feature is the one hand gold which is so handy when you also have bigger kids so you can hold on to them in the parking lots while packing up. The only downsides I think are the storage is not huge and the stroller doesn't have an option to convert to a double. Otherwise I'm very happy with this stroller that was given to me courtesy of weespring parent panel. Great features but could still be improved! I was so excited to receive this travel system from weeSpring Parent Panel! It was very easy to assemble. The car seat base is VERY heavy! It was easy to install and seems very secure. This was my first travel system. It made taking baby into stores easier to just quickly attach the car seat and not have to disturb her if she was sleeping. The car seat is heavier than our previous so I would not want to carry the car seat very far. I did find that the rear wheels are a bit too wide to easily go through store aisles at department stores and they are a bit wide for fitting in the back of my van but I managed. The one hand fold is very convenient. It folded up as much as my double stroller so still a bit thick for a single stroller but all the negatives are worth it for all the features - good size basket underneath, front access to the basket, full canopy to shade baby, pockets for drinks and zippered pocket for valuables. Peek-aboo/vent in canopy. My favorite feature is the pockets! I have really enjoyed this travel system! The car seat was a piece of cake to instal, and the stroller came practically put together. I absolutely love the infant car seat that comes with this set. It is a great size and my daughter looks very comfortable when strapped in. I LOVE the canopies on both the car seat and stroller. They glide silently and smoothly (which is nice when you don't want to wake your little one). The stroller canopy can actually work with the car seat making it possible to keep all sun off your babe while still leaving you with a window to peak in. My only complaints are with the stroller. It took my husband and I a bit to figure out the one-hand fold because there is a button you need to press first. It would be nice to have a tag hanging showing you this botton during set up. :) but now that we know, it's not a problem. The only other "issue" I have is that the stroller is a bit heavy while pushing with the car seat attached. I have to use strength to keep the stroller going in the direction I want it to (kind of like a car with an alignment that's a tad off). I'm getting used to it though and I wouldn't say it's a reason not to buy the system. Thank you to weeSpring Parent Panel for sending me this product to review. Bought travel system for my daycare business. Love it!! Very easy to assemble. Great features and mobility!